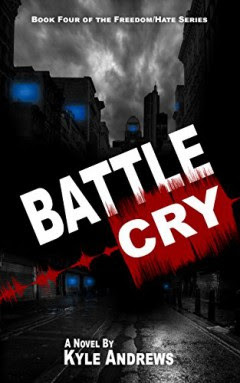 Battle Cry, the fourth book in the Freedom/Hate series by Kyle Andrews has just been released. For years, Freedom has waited for their opportunity to wage war against the authorities. They have hidden in shadows, preparing for they day when they would take back the rights that were stolen from them. Justin now serves the authorities. As a HAND officer, he patrols the streets, violating everything that he believes in, all in the hope that his position may someday give Freedom the edge it needs to win this war. Each day, he loses a piece of who he was. Each night, he prays that his sacrifice will justify his sins. From the Campus, Collin's team continues to spread Freedom's message to as many citizens as possible. They have expanded their operation beyond a simple newspaper. Now they spread the stories and history that the authorities have tried to keep from the citizens for decades. They produce original stories, to reflect their own fight, but it's not enough to spread words. Freedom starts with an idea, but it cannot end there. As Freedom waits for their chance to fight, millions are tuned in to watch the biggest sporting event of the year. A child, Mandi Hollinger, has been chosen to recite a pledge that she can barely remember. She is led onto a field which is covered in more green grass than she has ever seen in her life. Her parents watch from the sidelines, too scared to breathe, and longing for this day to be over. Mandi stands before the microphone and begins to speak. With one slip of the tongue, everything will change. The first book in this series is Freedom/Hate.